Risotto with Truffles 300 gr. - Casale Paradiso 6,55 EUR / 21,83 €/kg. Risotto with Porcini Mushrooms 300 gr. - Casale Paradiso 6,15 EUR / 20,50 €/kg. 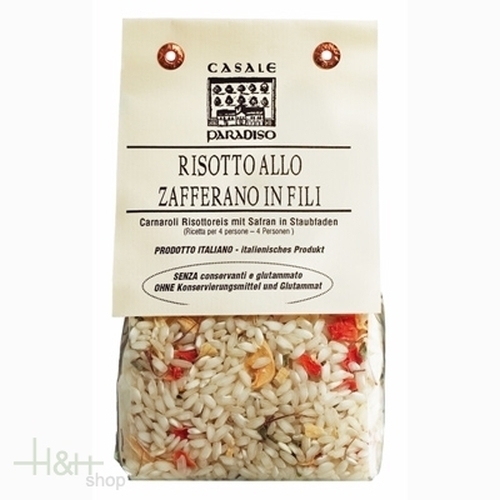 Risotto Mediterraneo with Vegetables 300 gr. - Casale Paradiso 6,15 EUR / 20,50 €/kg. Paradice Soup 300 gr. - Casale Paradiso 5,30 EUR / 17,67 €/kg. Risotto with Asparagus 300 gr. - Casale Paradiso 5,60 EUR / 18,67 €/kg. Risotto with Saffron Threads 300 gr. - Casale Paradiso 7,20 EUR / 24,00 €/kg. Tasty Soup 300 gr. - Casale Paradiso 5,30 EUR / 17,67 €/kg. Rice Vialone Nano Riso 1 kg. - De Tacchi 7,00 EUR / 7,00 €/kg. Countryman's Barley Soup 300 gr. - Casale Paradiso 6,05 EUR / 20,17 €/kg. Rice Carnaroli 500 gr. - Cá Vecchia 5,20 EUR / 1,04 €/100 gr. Rice 500 gr. - Acquerello 9,65 EUR / 1,93 €/100 gr. Risotto with tomatos 300 gr. - Casale Paradiso 6,65 EUR / 22,17 €/kg. Barley Soup with Porcini Mushrooms 300 gr. - Casale Paradiso 6,05 EUR / 20,17 €/kg. Spelt Soup with Porcini Mushrooms 300 gr. - Casale Paradiso 6,10 EUR / 20,33 €/kg.